At first glance, the car is very familiar. 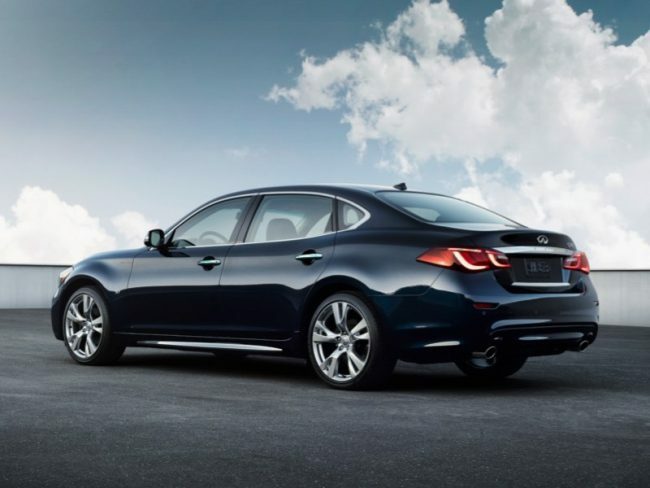 Apparently, Infiniti has not updated exterior styling very much in nearly a decade, and all of the sedan names now begin with “Q” instead of “G” or “M.” Also, that capital “L” after the Q70 signifies this is a long wheelbase car – the “limo” version of the Q sedan, sort of, as Infiniti throws in some 5.6 additional inches to the rear seating area. 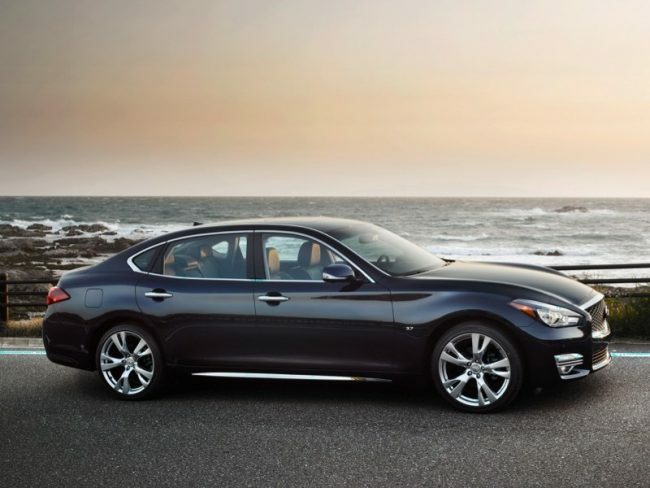 The Q70L arrives with the choice of 3.7-liter V-6 or 5.6-liter V-8 gasoline engines. They are both mated to a seven-speed automatic gearbox and the car can be had in rear- or all-wheel drive. Our tester arrived with power only going to the rear wheels but that power was courtesy of the beefy 416hp V-8. Surprisingly there were no steering wheel mounted paddle shifters, but the car does offer manual shift mode and features Downshift Rev Matching for those times when you want to feel like you are behind the wheel of a pure sports car. 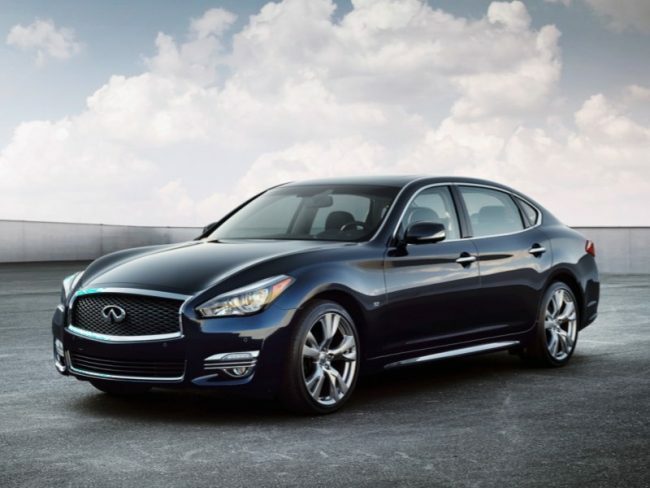 And Infiniti threw nearly every creature comfort and safety technology our tester that arrived in new Luxe trim. 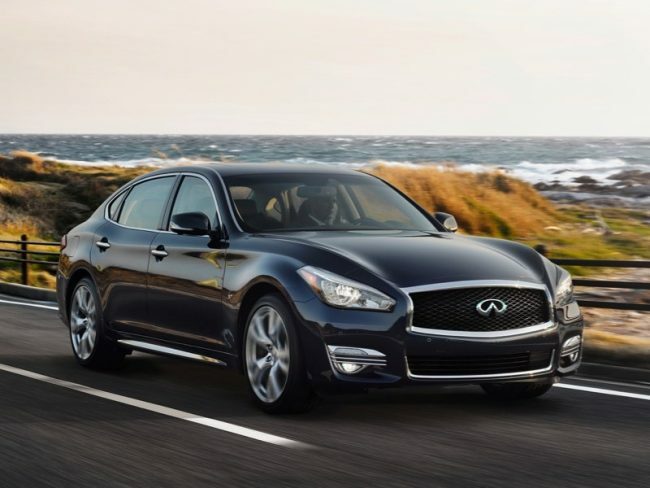 The styling of the Q70 embodies the design language of the Infiniti Essence concept that made the rounds in 2009. That was a gorgeous car with styling that holds true today in the form of this Q70L. Granted our Q70L did not have the 592hp engine of the Essence but many of the cues seen back then appear in the current Infiniti lineup. 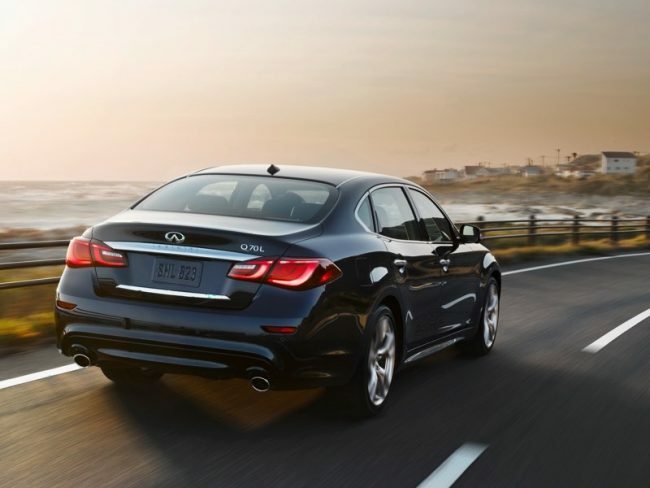 Back here in the real world, we see vehicles that have to abide by federal mandates but Infiniti manages to wrap everything into a comfortable, stylish package that even has some driving excitement to offer. Our loaded Luxe tester also arrived with a couple of additional packages to further our infinite Infiniti experience. The Proactive package adds predictive forward collision warning and forward emergency braking, intelligent cruise control with distance control assist, blind spot warning and blind spot intervention systems, backup collision intervention, lane departure warning and lane departure prevention, adaptive front lighting system with auto-leveling headlights, active trace control, and Eco Pedal. With this came the Sensory package that gave our test vehicle the Bose studio surround sound system with its 16 speakers, power rear sunshade, and additional interior trim accents and refinements. In addition to proving itself a more than capable daily driver on our trek to and from work, we took the Q70L on a weekend road trip where we really got to see what this car was made of. Some nice winding roads in the hills allowed us to put the long Infiniti through its paces and the car handled very well. True, most of the trip was at highway speeds on the interstate where the Q70L got to shine as well but no sooner did we settle back for long stretches than we found ourselves back in the twisties and back in “driver” mode. One thing I did notice while behind the wheel is these large low-profile tires love to try to take control of the front end, and I found myself having to work a little harder in this vehicle while behind the wheel than in other luxury sedans we have tested in recent times. The tires also exhibited a bit of road noise, other than that the Infiniti is whisper quiet. 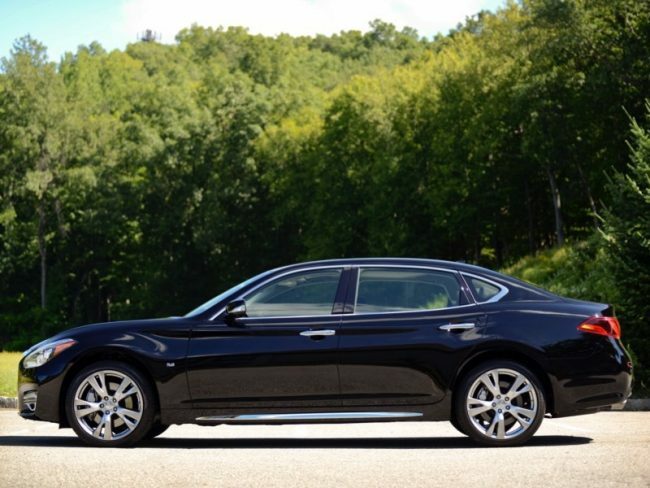 Pricing for the 2018 Infiniti Q70L begins at $51,800 with our loaded 5.6 Luxe model arriving with a final window sticker of $75,115. Fuel economy for the V-8 is rated at 16 mpg city and 24 mpg highway and we averaged right in the sweet spot during our week with the car. 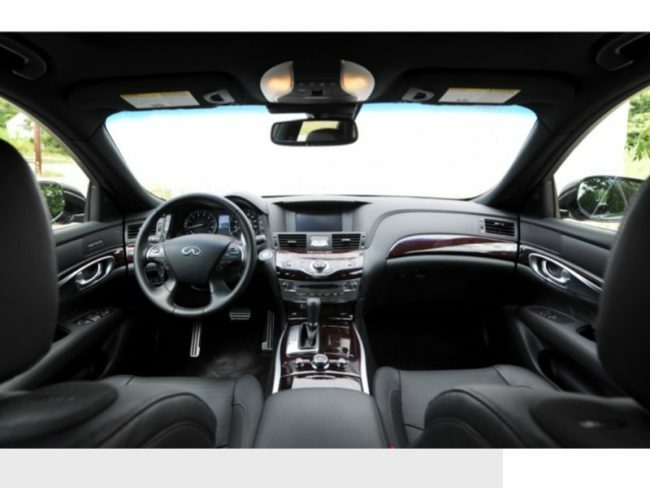 The Q70L is not the car for everyone as most of you do not have basketball players in your family but for those needing a few extra inches of legroom in the rear seat area, this Infiniti may be right up your alley. 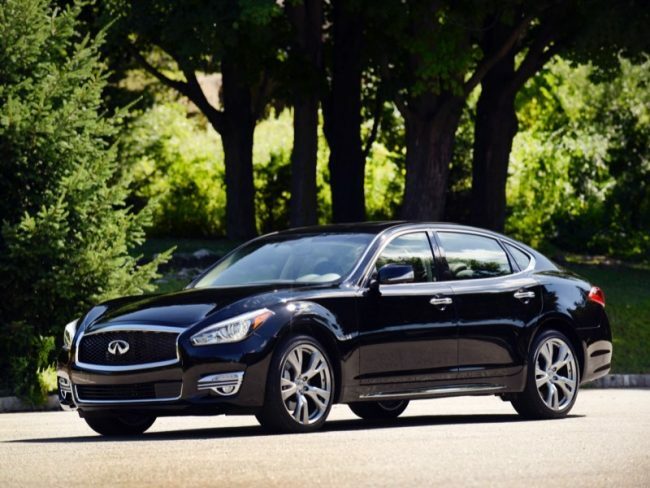 There is a small competitive set for this type luxury sport sedan and the Infiniti Q70L fits right in.